Creating a TV show based on 12 Monkeys is a daunting prospect. There's the closed-ended movie storyline, plus all that twisty time-travel. Luckily, the showrunner of 12 Monkeys, Natalie Chaidez, was a writer for Terminator: The Sarah Connor Chronicles. She tells io9 what lessons from Terminator she brought to Monkeys. We've seen the first few episodes of Syfy's 12 Monkeys show, which starts tomorrow night at 9 PM, and we've been blown away so far. The TV show reminded us a lot of another movie-turned-TV series, Sarah Connor Chronicles — even before we realized that a former T:SCC writer was the showrunner. It's a cracking great thriller, with fully fleshed out characters and an engrossing storyline, and it's the most addictive new show I've seen in ages. For those of you who missed the beloved 1995 movie, directed by Terry Gilliam, it's a loose remake of a 1962 French short film called La Jetée. In a future devastated by a plague that wiped out most of humanity, a man named Cole gets sent back in time to the present, to obtain a sample of the virus and find out what happened. But he gets stuck in a mental institution and caught up in weird mysteries about the Army of the 12 Monkeys, an animal-rights organization. The TV version uses the movie as a jumping-off point, and then makes some pretty major changes. Jeffrey, played by Brad Pitt in the movie, is now Jennifer, played by Emily Hampshire. And the big questions are clearly going to have very different answers. Plus the TV show understandably ditches the notion that you can't change the past, and Cole's mission is to prevent the plague, not just understand it. 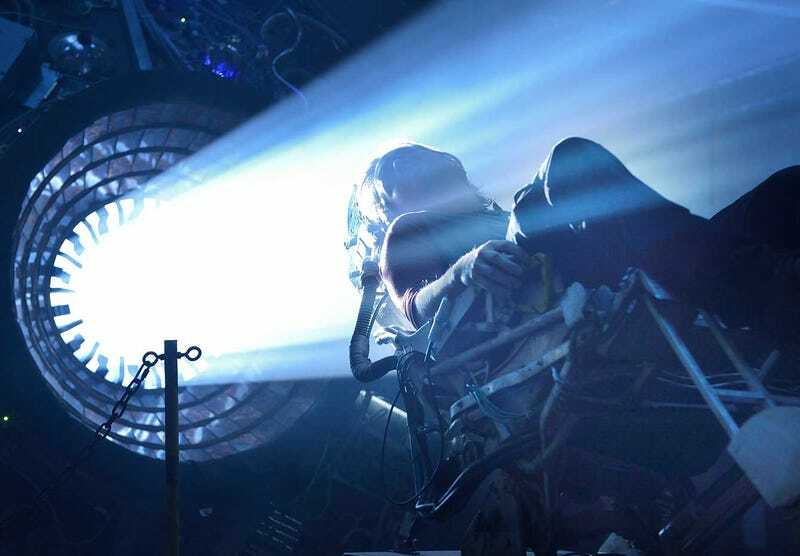 1) "Time travel isn't important unless people care about the characters"
The 12 Monkeys TV show, like Sarah Connor Chronicles, does some clever things with time travel, including toying with the idea of changing the timeline with disastrous consequences. But the thing that keeps you fascinated by the unfolding action is the focus on the damaged characters and their relationships. "If the story isn't emotionally grounded, all the talk about the paradoxes and the intellectual puzzles that we as science fiction fans love about time travel will never engage your audience," says Chaidez. She learned that on T:SCC as well as Heroes, which also dealt with time travel and a post-apocalyptic future. It's easy for a TV show to get lost in cool ideas, and lose sight of the characters. On T:SCC, "the strong bond between Sarah and John, and that arc through the season, had to be the foundation of our show and not a sort of mechanical plot thing," says Chaidez. The big question to ask is, "what is the human journey that we're taking? We're taking ordinary humans through an extraordinary circumstance of discovering time travel or discovering killer robots come back from the future, and what does that do to them?" One reason showrunner Josh Friedman hired Chaidez for T:SCC was because she had a 15-year-old son, and could bring a unique perspective on the show's mother-son dynamic. So on 12 Monkeys, Chaidez says she talked a lot with creators Terry Matalas and Travis Fickett, who wrote the pilot, about how to make sure "that the arc of season one was deeply about Cole's journey, was about [Cassandra] Railly's journey, [and] was about their relationship." 2) Don't "fall down the rabbit hole of time travel"
On a related note, it's easy to get sucked into obsessing about the mechanics of time travel, to the point where it overwhelms everything else. On Sarah Connor Chronicles, the writers' room was full of incredible science fiction geeks, so "we could have easily spent all day everyday talking about paradoxes and timelines and often did," says Chaidez. But they had to remember to get back to the story, too. It's important to make sure the heroes of the story are fully fleshed out and behave in a way that seems logical from their stand point — but it's also vital to ensure "your villains are equally realistic and equally grounded," says Chaidez. And also, make sure the villains have a plot that makes sense from their standpoint, says Chaidez. "We worked hard on Sarah Connor to come up with intriguing villains, and the casting of Shirley Manson, and we worked equally hard on 12 Monkeys to craft a group that is really mysterious and interesting." The villains of 12 Monkeys aren't exactly human, she hints, but they have their own valid viewpoint and their own logic. In the case of both Sarah Connor Chronicles and 12 Monkeys, the TVshow revisits a lot of characters and settings from the movie, but then delves quite a bit deeper. "The great thing about being able to adapt a classic movie into a TV show is that all those dark corners you were hoping to peer into," you can now spend time in, Chaidez says. "You know, you're like, 'If I could just see what was around that corner that is really cool.' [And now], you can do it." "Like in Terminator, you're like, 'I wonder how they constructed the drone.' And we lay it out. This is the groundwork." The Terminator show actually introduces you to the "water and heating plant" where the first drone is being constructed. "So all of that stuff that is intriguing to you about the future, you have the opportunity to go out and to explore, and we certainly did that on Sarah Connor." They would geek out endlessly about what happens after Judgment Day, and how humans built an army in the future — and the future submarine in one epic two-parter came out of those discussions. "All of those intriguing questions that the future raises but you just don't have time to explore, those were like jumping off points for episodes," says Chaidez. A lot of it involved "talking through the rules of the world that had already been laid out in the movies," but then asking "how would it have actually worked?" So that same level of attention to world-building came in handy when it came to 12 Monkeys. "Terry and Travis and I would [ask], 'Okay, well, what is the world like outside? Did the plague kill the birds? How many weapons are left in the world? Are there bullets?' And that led us to opening up the world outside the time facility which you glimpse in the movie." Watching the post-apocalyptic future scenes in the movie, you get a sense of a lot of cool stuff, but "you don't really get to see much more of the future," says Chaidez. "So in season one, we have the opportunity to explore what that world was like. We're able to go into the time period between the time the plague struck [and the beginning of time travel]." It's very similar to the way Sarah Connor Chronicles tried to fill in the gaps between Judgment Day and the time when Kyle Reese first got sent back in time, says Chaidez. "It's kind of like filling in that empty space where your mind is able to wander," says Chaidez. You can spend time imagining: "Wow, that must have been hard for the humans. That must have been cool." At the same time, the 12 Monkeys TV show is not a continuation of the movie the way Sarah Connor Chronicles was for Terminator 2 — so instead of being bound by the stuff established by the movie, the TV show can use it as a jumping-off point. On Sarah Connor Chronicles, showrunner Josh Friedman was very vocal about saying that the show would avoid having a "Terminator of the week" format, where every week Sarah and John would be hunting yet another killer robot from the future. "It's really a pitfall of these kinds of shows," says Chaidez. "Early on, a studio executive who will go unnamed said, 'Well, there's twelve episodes ordered, and there's twelve monkeys. So every week, you'll catch a different monkey.'" She laughs. "Terry and Travis said, 'No, that's not how it's going to work.'" Instead, the show is much more serialized, and much more focused on the relationship between Cole and Dr. Cassandra Railly. The Sarah Connor Chronicles pilot does this in a big way, starting off with a dream sequence that reminds viewers just what will happen if Sarah and John lose their fight. And Chaidez says 12 Monkeys works equally hard to establish the stakes at the very beginning, showing just how devastating the plague was, and how messed up the future is, right at the start. At the same time, it's important to give the audience the hope that the dark future can be changed, says Chaidez. "It really is a tricky balance" — the threat needs to seem unstoppable, but the audience has to feel like it's not completely hopeless, or "it's kind of easy to lose heart, and for the audience to feel a little bit cheated." Also, once you have clear stakes, then you can take your time and let other storylines develop, without worrying that the audience will lose interest in the main storyline, says Chaidez. Another key lesson that Chaidez learned on Heroes as well as Terminator is "having tentpoles for your seasons, so that you know where you're going." That way, you don't get "caught up with a particular cool plot that is going to screw you up later." If you don't have a few foundational pieces of your season-long storyline in place in advance, "you get lost, the audience gets lost, and the audience feels very cheated." It's like driving across the country, says Chaidez — if you know you're going to stop in Phoenix, Dallas, Chicago and Philadelphia, then you can "take all kinds of cool detours in between, but you're still headed in the right direction." She felt like they had a very clear sense of where Heroes season one was heading, and ditto for both seasons of Sarah Connor Chronicles. "Having those as creative goalposts along the way just gives you a lot of confidence and a lot of freedom and allows you to avoid the pitfalls" that can lead to a show feeling like it's lost its way. Audiences "can feel it when you're flailing and you're making it up week-to-week especially on something [as complicated] as time travel." In addition to sharing her lessons from Sarah Connor Chronicles, Chaidez also explained the backstory of how Terry Gilliam's famously mind-bending movie became an ongoing show on Syfy. This show wasn't originally pitched as a 12 Monkeys reboot — Matalas and Fickett had written a spec script about time travel called "Splinter." And then the script was read by Atlas Entertainment, who had the rights to Gilliam's film, and asked if it could be "a jumping-off point for a 12 Monkeys remake," Chaidez explains. Splinter and 12 Monkeys"shared some more elements, but were not exactly the same." Matalas and Fickett have said that if they had been hired to turn 12 Monkeys into a show, they would have said no, because that's such a daunting prospect — but they were able to adapt their own ideas into a version of Gilliam's story. Chaidez says she's seen Gilliam's film "probably ten or twelve times. I actually did not rewatch it a lot after I got the job, because I wanted my mind to be free to create a different world." The writers definitely did watch the 1962 film La Jetée, and there are a few places in the TV show where the imagery is reminiscent of the French movie. More than that, they've tried "to recapture the initial creative instinct of La Jetée, which is like an epic romance. 'I've fallen in love with this woman. I've seen my own death.' A sense of poetry, a sense of mystery," says Chaidez. One thing from La Jetée that comes up later in the first season of the TV show is revisiting Cole's childhood, and letting him see it again as an adult. "It's not exactly the same plot but it's the same idea of revisiting a moment in your childhood and the notion of not understanding what that moment was and seeing it through new eyes as an adult," Chaidez notes. As for turning Brad Pitt's iconic character Jeffrey into Jennifer, Chaidez says that Matalas and Fickett decided to do that "because Brad Pitt's performance seems so iconic. It just didn't seem like something you could match." And they wanted to delve into the idea of being the daughter of mad scientist Leland Goines. "When you see Leland Goines in the pilot, you wonder, 'What was it like to be raised by that guy?'" That makes Jennifer instantly a more sympathetic character. "I think taking the time to explore the relationship between Leland and Jennifer — which is briefly glossed over in the movie — led to a more sympathetic portrayal. And the fact that she is a little bit of a pawn in his bitter scheme which is not exactly the same as the movie." In the TV show, Jennifer plays a very different role in the plot than Jeffrey did in the movie, and her character is reimagined quite a bit. "She's a brilliant genius, who has sort of gone astray," says Chaidez. Also, Emily Hampshire's performance "draws you in," by being as "big and unexpected a wild card as she is." And meanwhile, Cassandra Railly is a virologist instead of a therapist, which allows the show to visit the Centers for Disease Control and Prevention, and makes her more central to the show's pandemic storyline. Chaidez says they already have big plans for season two, although she's leaving to launch Hunters, another Syfy show based on Whitley Streiber's Alien Hunter novels. (She describes it as "Homeland with aliens.") But she's still working as a consultant on season two, and they're planning to "open up the world of the future even more. We're going to do even more cool time travel [and] go to even more places that we haven't been before." I asked Chaidez if they feel intimidated by the comparison to Gilliam's iconic movie, which has such a unique and recognizable style. She says it's not as intimidating as it could be, "because the show is really a reimagining. I think if we had tried to do a steampunk aesthetic or tried to stick a bit more closely to what Gilliam had done, it would have been much, much more daunting." Having the freedom to recreate the look and feel of the storyline from scratch helped them to avoid feeling "entirely intimidated by remaking a masterpiece," she laughs. "I feel honored to be working on the same material that someone as brilliant as Terry Gilliam also worked on," Chaidez adds.